This thong is inspired by the antique lace of Flora Klickmann. It is made up of 2 parts: (1) the basic crocheted thong, and (2) the wide antique lace that goes around the thong. 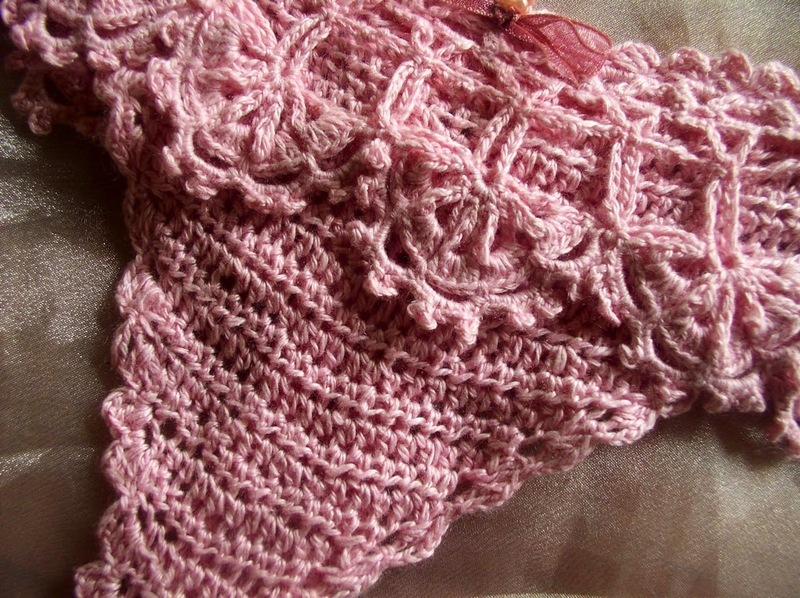 The lace is simply sewn over the basic thong, and a waistband is crocheted over the two layers of crocheted fabric. Finally, the thong is decorated with sheer organdy ribbons and pearl beads in the front and back. The thong also has a “keyhole” feature at the back and you can easily make this if you wish. 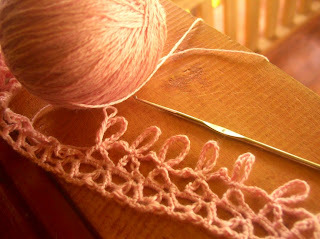 You will just need to modify a basic crochet thong pattern to make the split at the back. Using half double crochet stitches, I made the basic thong in one piece starting at the front and decreasing into a triangle shape. Then I continued to the crotch and the narrow strip at back which is about 5 stitches wide. Then about 2 inches before reaching the last row at the back, I split to make the “keyhole” feature. The thong may be worn with ties or with an elastic. Make this of suitable length to go around your hips. If you are making a thong that ties at the sides, then you must make two of these lace strips that is each half the size of your hips. Row 1: Chain 8, in first chain make (double crochet, chain 3, double crochet), chain 7, turn. Row 2: 4 single crochet in first space, chain 3, 4 single crochet in second space. Chain 6, turn. Row 3: 4 single crochet in in first space, chain 3, in next space make (double crochet, chain 3, double crochet), chain 7, turn. 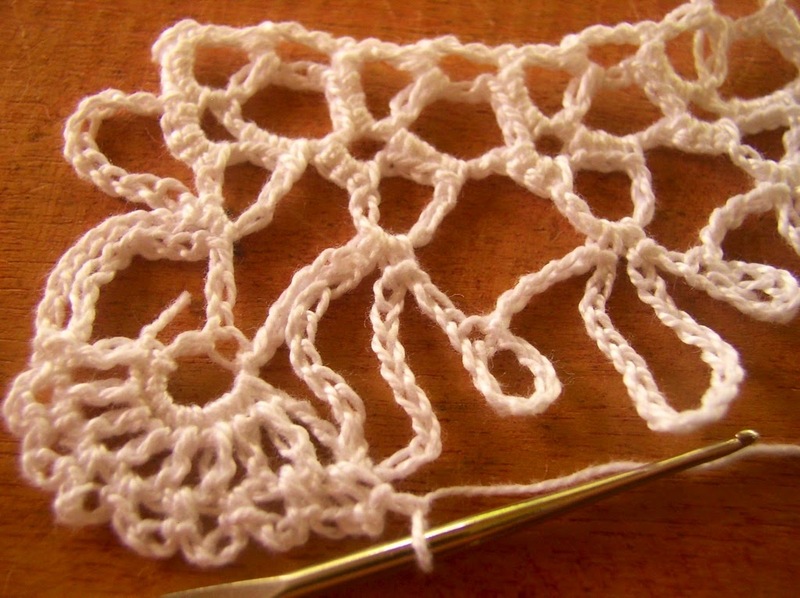 Succeeding rows: Repeat rows 2-3 until the lace is of desired length. End with row 2 and with multiples of 2+1 number of 6-chain loops. End with chain 4 instead of chain 7. Turn. Double crochet in 3-chain loop, chain 1, single crochet in top of double crochet, *chain 14, turn, slip stitch in single crochet, chain 6, remove hook from loop, insert hook in third chain, catch loop and draw through the chain (picot made), chain 3, single crochet in next 6-chain loop, repeat from * to the last 6-chain loop. Fasten off. 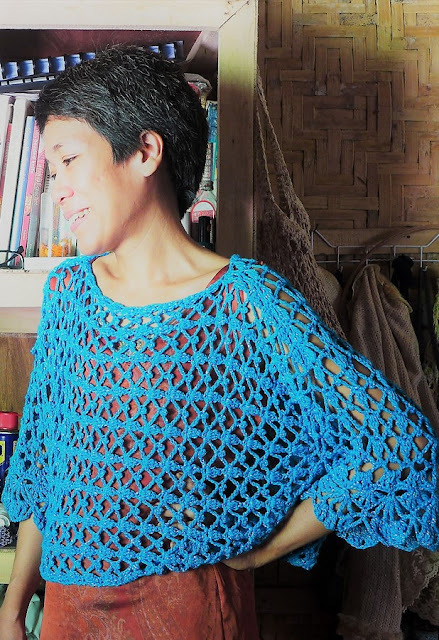 With right side facing, join thread with single crochet to second 14-chain loop, *(chain 10, single crochet in same 14-chain loop) 5 times, chain 4, pass 4-chain behind the five 10-chain loops and join with slip stitch to the base of the first 10-chain loop; chain 5, 5 double crochet in each of the five 10-chain loops, chain 1, turn, single crochet in first double crochet, (chain 5, single crochet in space between 10-chain loop) 4 times, chain 5, single crochet in top of 5-chain, slip stitch in previous 14-chain loop to join, turn. In each 5-chain loop make (3 single crochet, chain 5, 3 single crochet, chain 5, 3 single crochet). 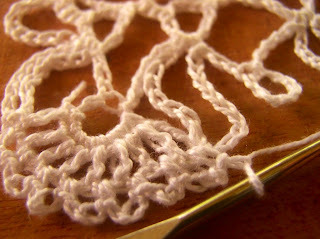 Slip stitch in next 14-chain loop to join. 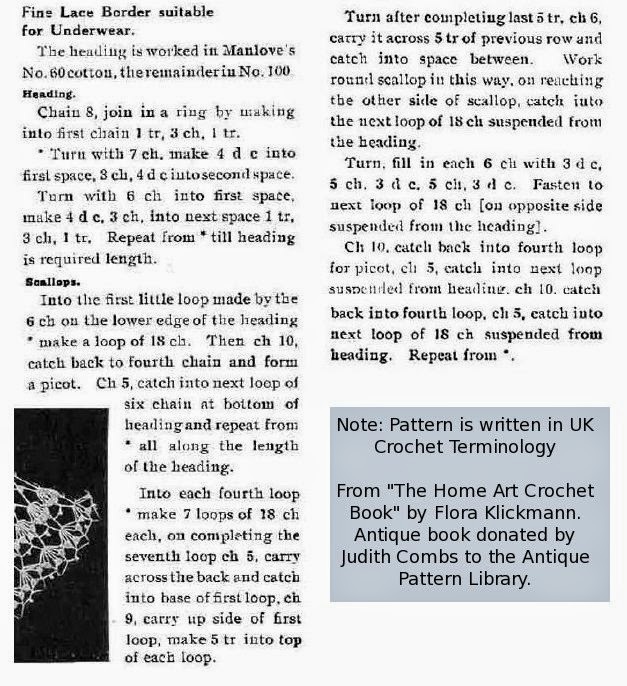 Chain 5, single crochet in next 14-chain loop. Repeat from * to the last 14-chain loop. Fasten off. 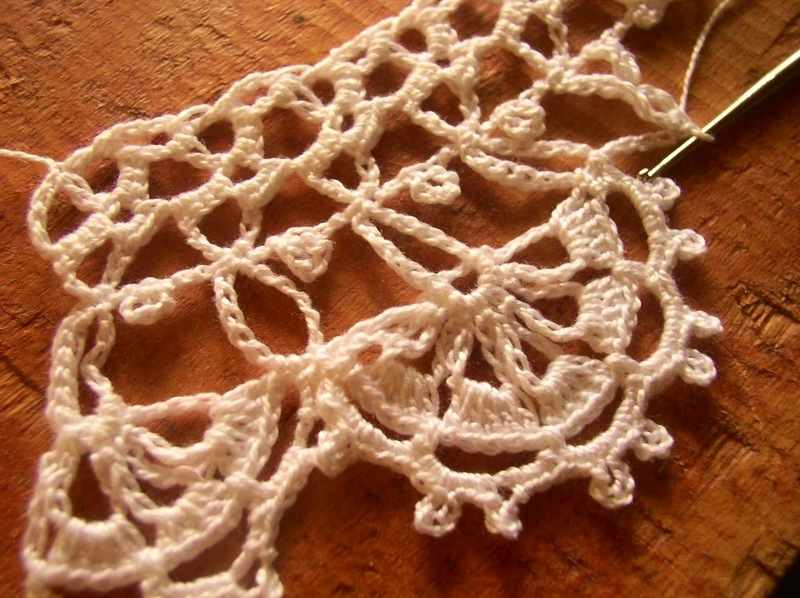 The original lace pattern by Flora Klickmann (ed.) More at The Antique Pattern Library. This trim is done around the waist and around the openings for the legs. Join with single crochet to edge of thong. 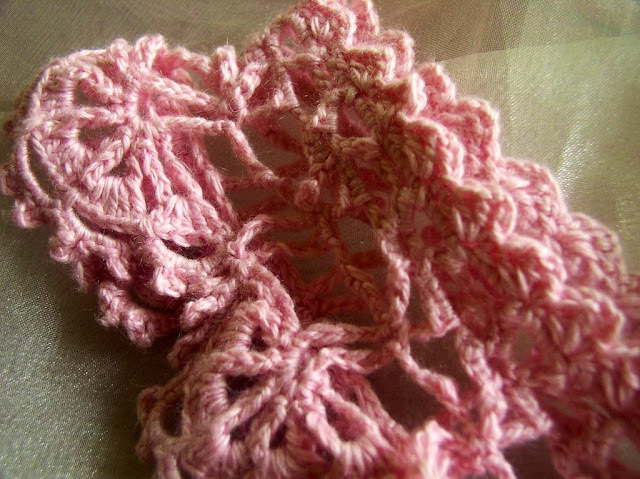 *Chain 3, 2 double crochet in single crochet, skip 2 stitches, single crochet in next stitch. Repeat from * for the scallop edge pattern.